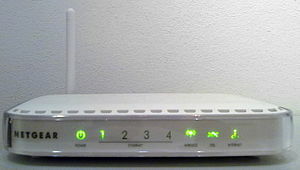 As far as connectivity options on the DG834G router, it accepts network printers – it does lack the USB connectivity which seems to be coming up in all routers these days. It makes the job of connecting your USB printer/hard drive to your network a cake walk. So there isn’t much to talk about on the peripheral connectivity side of this router. I have the modem/router installed inside a shelf on the upper most rack. I did not expect a very good reception because of too many walls and other electronic equipment spread across the place. But i was in for a pleasant surprise when i could pick up the signal pretty far away at very decent speeds. I must appreciate Netgear on their work in this area, living in a two storeyed house and leaving the router inside a shelf in the drawing room and still able to pick up the signal in my kitchen located, across atleast across 4 walls and a floor above is pretty impressive. Is it worthwhile to choose the Super 108Mbps product than this normal one? Well, its really not necessary to spend on the super model as the normal 54Mbps one is perfectly equipped to handle speeds far greater than the ADSL line itself, therefore unless you get the Super variant at a very competing price i wouldn’t recommend it. But if you live in a huge place!! then obviously the 108Mbps variant has more coverage! I am not quite satisfied with the pricing of home routers in India generally. But then it is just a matter of time and wireless penetration which should bring down the prices of such devices. For about 3.5 grand this router/modem is good buy. Word of advise – Do not buy/lease the router than BSNL provides along with its broadband connection! They’re one of the most poorly designed network hardware that I’ve ever come across. In any case a router purchase from BSNL would cost you around 1 to1.3 grand, which when added along with trouble free configuration and support as well as Wireless coverage for your entire house i feel the price of the Netgear is quite justified.